The Gilbert ® Blitz Rugby Body Armour has been developed with performance in mind. The range provides option for all levels of the game. With enhanced breathability from strategically placed mesh panels, all Gilbert padding provides performance and comfort for players of all levels. 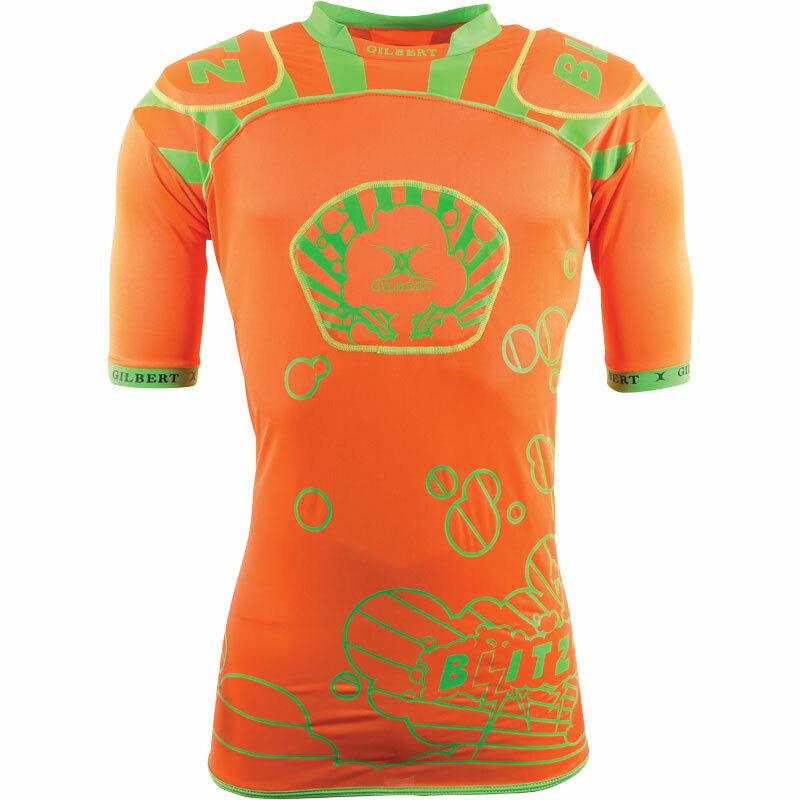 Funky design and functional performance combined into one protective top. Key shoulder and sternum padding. The top is very robust and the padding is far superior to the last to top I bought my son, but washing it is not easy. The pads should be removable. I visited the warehouse and collected the top rather than ordering online. The staff were very helpful and I didn't have to wait for it to be delivered. Brilliant product and good value for money. buy a size larger than you need as it will leave growing room. great product and nice matching colours! This product was purchased for my 12 year old. It provides excellent protection and at the same time allows the body to breathe. It washes well with the protective pads retaining their shape. Overall I would give this product a 5 star rating. I bought this for my son, the only downside Is the shoulder pads very flimsy and uncomfortable Solve this and it will be a very good product. Quite pleased with it - however on the first wash the colours did run quite badly. I bought the green and black one. Luckily it's worn underneath! My youngest son really likes this, which means he will use it. Looks are important with kids being so self conscious but this is well made and the padding is sown in unlike some other brands where the foam padding falls out. delivered quickly - just what she wanted. Your website is easy to use - thank you. Though the site might better reflect the number of girls playing rugby! Very pleased with this body armour for my son. It's comfortable, practical and another layer of warmth with the oncoming cold weather. Great !! This is a great product and meets with my son's approval! He is especially pleased with the ease of movement it allows him. He's able to run and pass comfortably, as well as tackle. The padding on the shoulders offer good protection without being too bulky. The garment is very light but still does a good job. A good buy. My son loves this top and I love it because it's so easy to spot him during rugby practice (he choose the lime green version). Efficient delivery too! Bought for my teenage son who reports this armour to fit well and very comfortable with padding in all the right places. I report a fantastic price and very good quality. Fits well and offers good protection, only criticism would be that the plastic embellishments started falling off after second wash. Since the armour has to be washed up to 4 times a week, there will soon be no stickers left. 4 out of 5 Great colours, snug fit. Bought this for my skinny 11year old. After reading reveiws we went for the medium boys & it fits but is snug. My son loves the colours but would have liked a bit more padding especially on the chest. Having said that the amount of padding seems to be standard across all the makes we looked at and at least the Gilbert has arm pads too. Haven't washed it yet but so far so good. Prompt delivery from Newitts, great colours - boys really pleased with the fit. Comfortable & easy to wear. Only downside was being handwash only - not much fun when there is loads of other kit to wash! Very happy with this product and the cost is reasonable in that it doubles as an "underarmour" layer also. The padding on the shoulders is not too bulky and my son feels very comfortable wearing it. I would recommend without hesitation. They are a very suitable padding choice for anyone at school level rugby they are highly visible so you won't lose them thus are a very good choice for purchase.